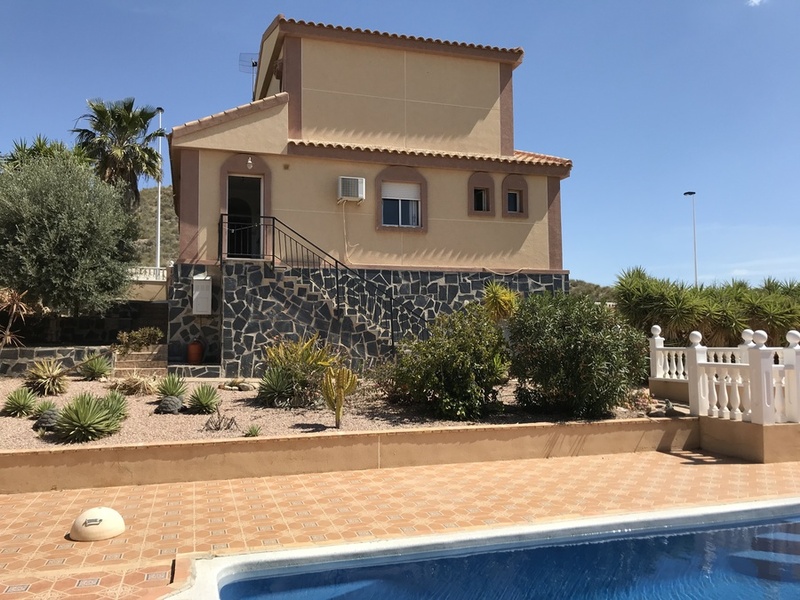 A lovely detached Neptuno model villa with 3 bedrooms and 3 bathrooms, private swimming pool, fireplace, hot and cold air-conditioning, off-road parking and under build on the final phase of Camposol in Murcia. 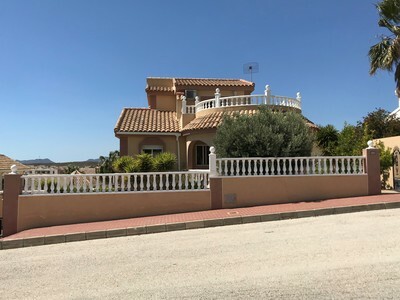 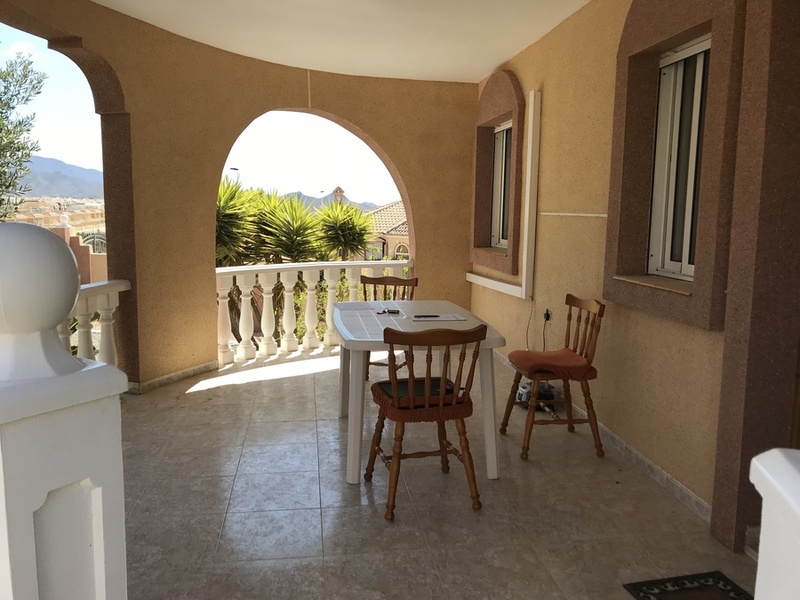 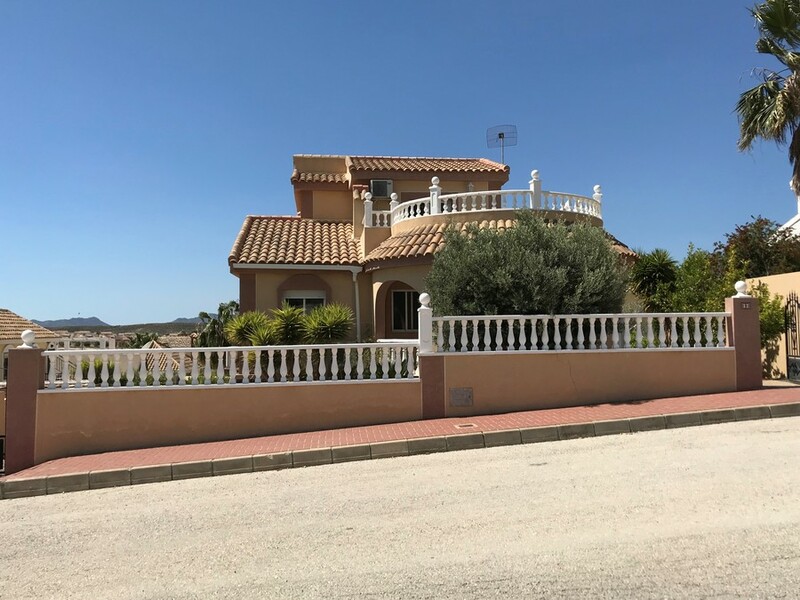 Situated on a quiet street, the property is entered via a few stairs leading in to the front terrace with nice open views to the countryside and no other properties opposite the house. The cosy and spacious lounge is nicely furnished throughout and benefits from hot & cold air-conditioning and a wood burning fireplace. 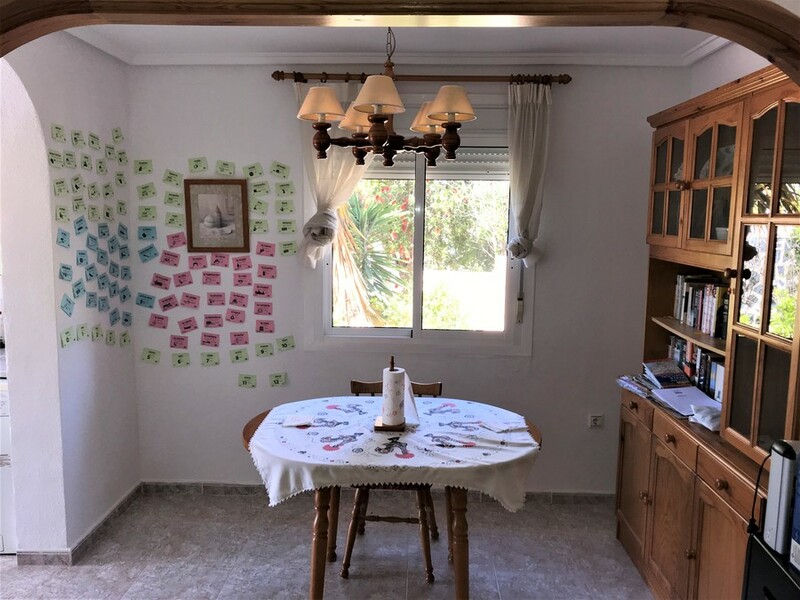 The dining room is adjacent to the well equipped kitchen with light wood upper and lower units, oven, hob and extractor fan, dishwasher and all other domestic electrical appliances. The back door from the kitchen leads out to stairs for access to the garden and pool area. 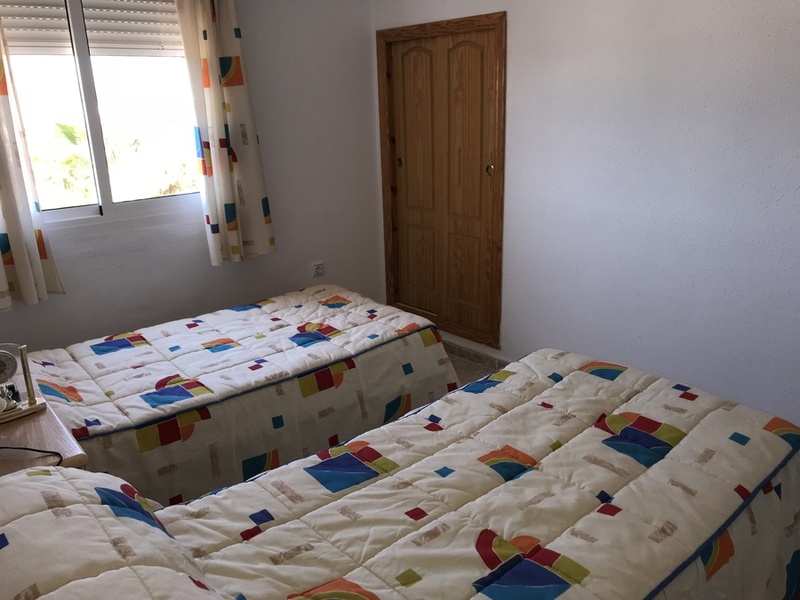 There are three double bedrooms in total, two downstairs, one upstairs, two en-suites, all with fitted wardrobes and dual air-conditioning. 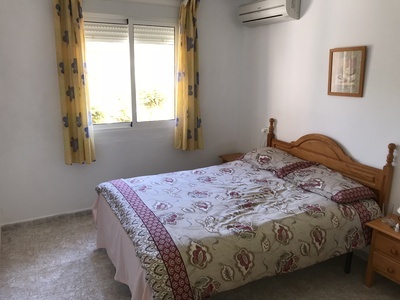 The master bedroom is upstairs and accessed by internal stairs with patio doors leading out to the large solarium offering lovely views to the mountains. 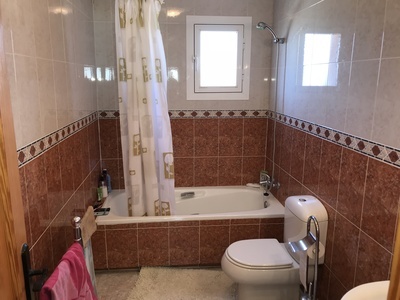 The en-suite bathroom is fully tiled with bath and overhead shower, bidet, sink with vanity unit and W.C. The second bathroom with shower, sink and W.C. is downstairs as is the third family bathroom. 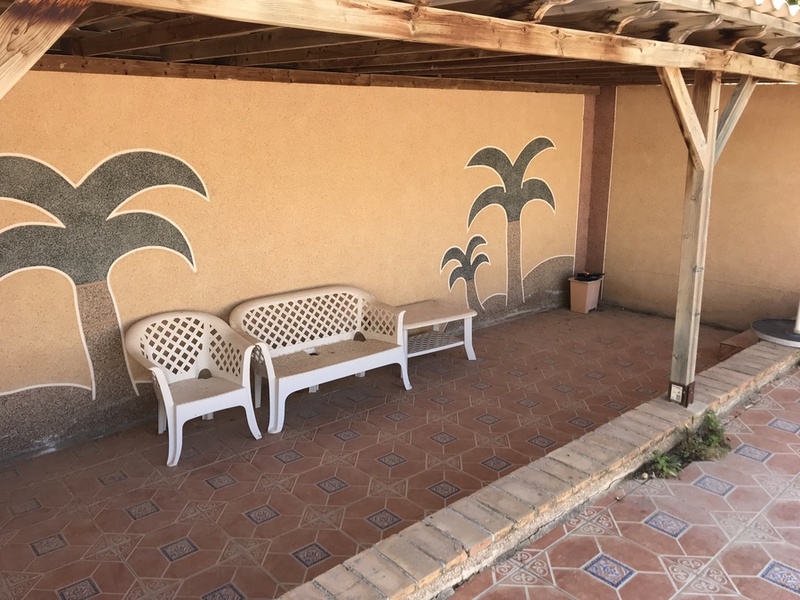 The well maintained garden is a mixture of tiles and gravel with many plants, shrubs and trees. 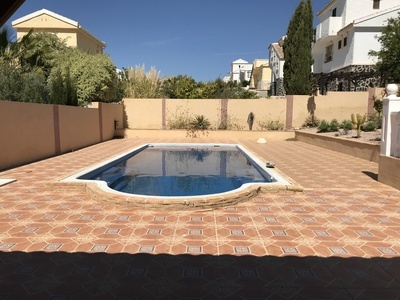 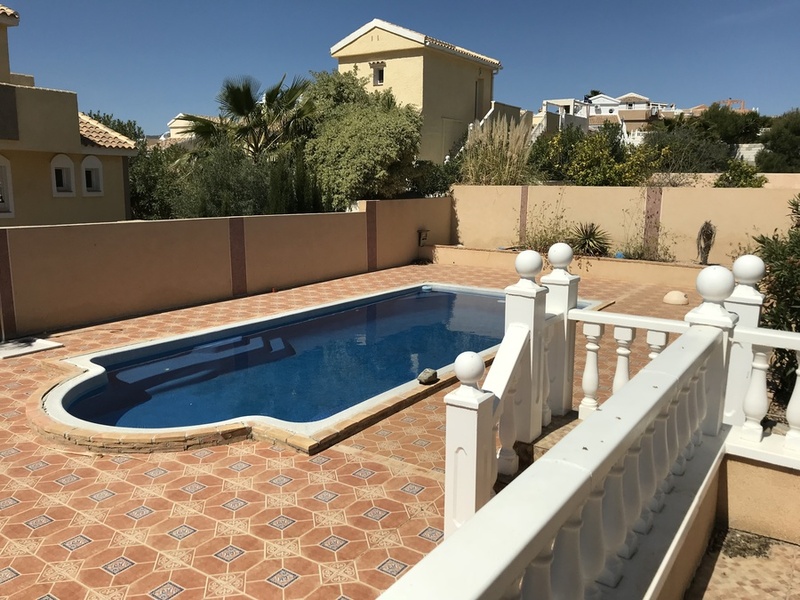 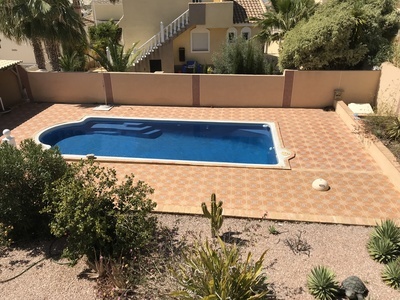 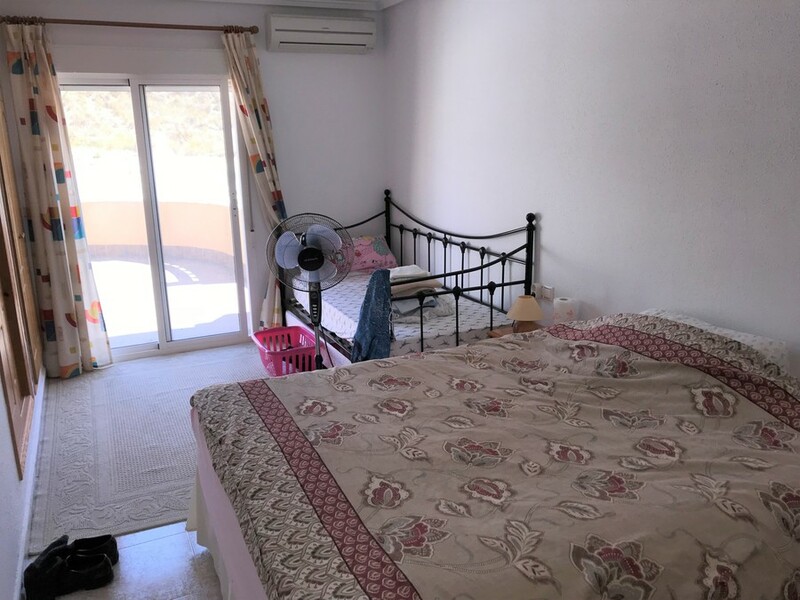 There is a 10 x 4 swimming pool with Roman steps and plenty of room to relax on the sun loungers and also by the pool is a long shaded area with storage. There is off-road parking for up to 6 vehicles and plenty of places for storage within the property. 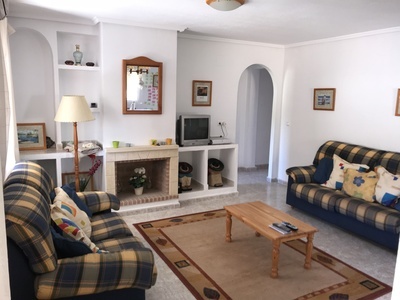 The property sits on a 730 sqm plot and has a living area of 120 sqm. 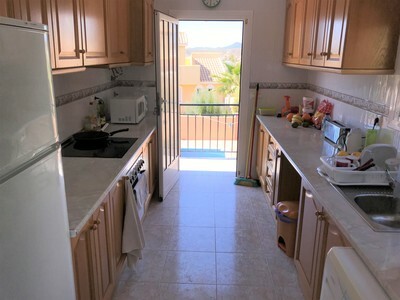 The property has fly-screens and shutters to all windows and is being sold fully furnished and with white goods. Camposol is located 15 minutes from the blue flag beaches of Puerto de Mazarron and Bolnuevo. 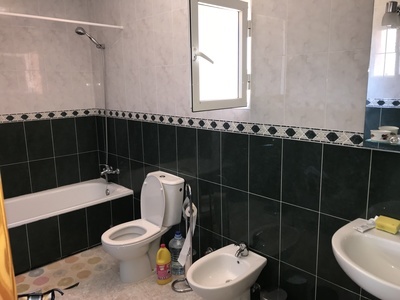 The new Corvera airport is just 20 minutes away. 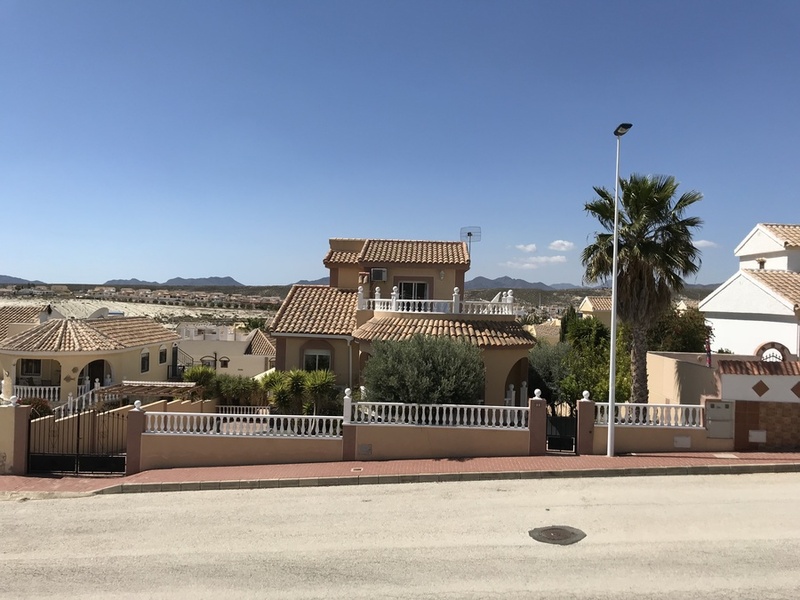 In addition to the 18 hole Sensol golf course within Camposol, there is the Jack Nicklaus course 10 minutes away in Alhama de Murcia. 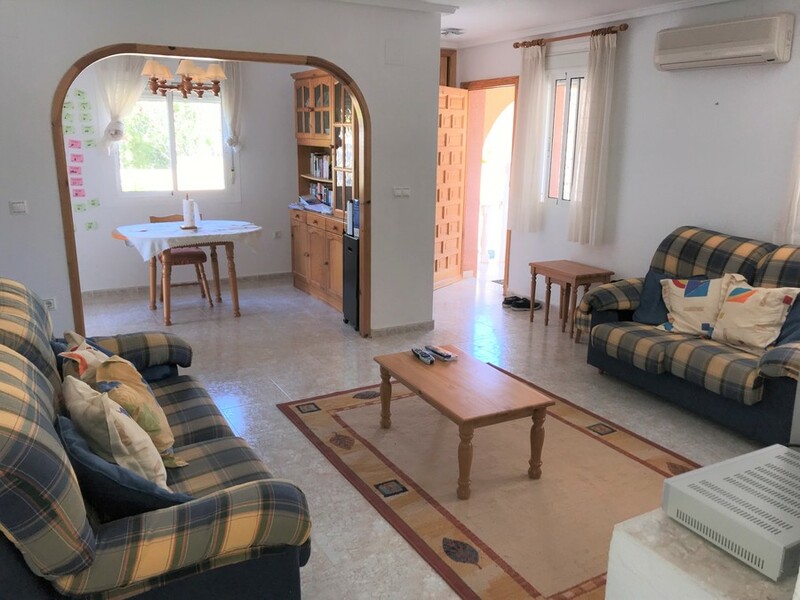 Camposol has a selection of shops, bars, restaurants, banks, dentists, health clinic, cultural centre, petrol station and lots of activities for adults and children.